The Hungarian Formula one (F1) Grand prix is the eleventh race in the 2016 Formula one (F1) season in Mogyorod near Budapest at the Hungaroring on the 24th July 2016. Due to the nature of the track, narrow, twisty and often dusty because of under-use, the Hungarian Grand Prix is associated with processional races, with sometimes many cars following one another, unable to pass. Thierry Boutsen demonstrated this perfectly in 1990, keeping his slower Williams car in front of champion-elect Ayrton Senna, unable to find a way by. The secret to a winning performance at Hungaroring, as well as qualifying well, is pit strategy, best demonstrated in 1998, where Michael Schumacher’s Ferrari team changed his strategy mid-race before Schumacher put in one of his finest drives to build up a winning margin after all the stops had been made. Passing is a rarity here, although the 1989 race saw a famously bullish performance from Nigel Mansell in the Ferrari, who started from 12th on the grid and passed car after car, finally taking the lead in splendid opportunist style when Ayrton Senna was baulked by a slower runner. The circuit was modified slightly in 2003 in an attempt to allow more passing. Other notable occasions in Budapest include first Grand Prix wins for Damon Hill in 1993, Fernando Alonso (in 2003), the first Grand Prix winner from Spain, who also became the youngest ever driver (at the time) to win a GP, Jenson Button in an incident-packed race in 2006 and Heikki Kovalainen in 2008, the latter of whom was also the 100th Grand Prix winner. Also noteworthy is Damon Hill’s near-win in the technically inferior Arrows-Yamaha in 1997, when his car lost drive on the last lap causing him to coast in second place, and Lewis Hamilton coming within six seconds of winning in 2014, despite starting the race from the pit lane. In 2001, Michael Schumacher equalled Alain Prost’s then record 51 Grand Prix wins at the Hungaroring, in the drive which also secured his 4th World Title which also matched Prost’s career tally. The 2006 Grand Prix was the first to be held here in wet conditions. Button took his first victory from 14th place on the grid. 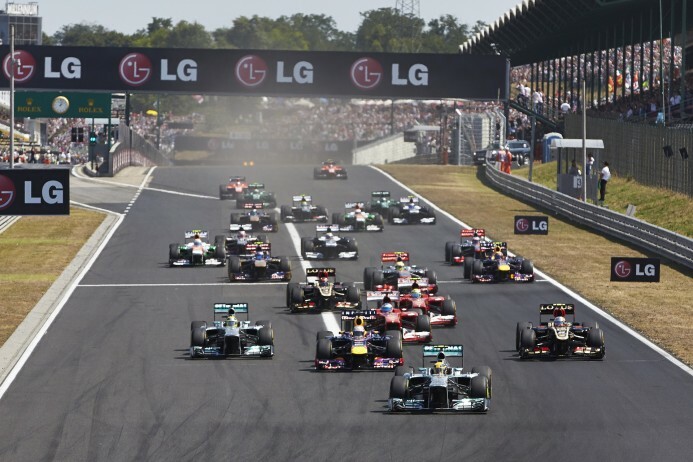 At the 2013 Hungarian Grand Prix, it was confirmed that Hungary will continue to host a Formula 1 race until 2021. The Hungaroring lies 42 kilometres away from Budapest Ferenc Liszt international airport (LHBP / BUD) around 35 minutes by car subject to traffic. A helicopter transfer from Budapest International airport will land you at the Hungaroring ring in 10 minutes. Arranging a private jet charter or helicopter transfer with Freedom Air to arrive in style to the Hungarian formula one (F1) grand prix in Mogyorod is simple. The Freedom Air team can be reached on +44 (0) 1275 548001 and charters@flyfreedomair.com to book your next trip.